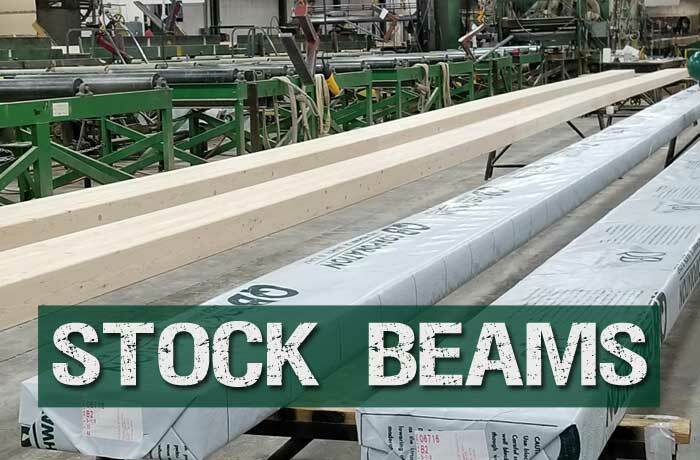 QB stocks various standard sized beams (3.125”, 5.125”, and 6.75”) for quicker shipments and deliveries to your jobsite. The laminated beams are cambered at 5000’ and at lengths greater than 48’. We inventory architectural finished beams, and all beams are Douglas fir. The list of beams inventoried can be slightly altered by either adding other depths or removing certain depths due to changes in demand. If you do not see your size needed listed below please contact the sales team and they will be happy to work with you in providing what you need. QB is well known and regarded as one of the best custom beam manufacturers in the United States. What people don’t know is that QB is also a highly sophisticated manufacturer of stock beams. These beams typically work in residential structures and typically are provided in 3-1/8”, 5-1/8”, 6-3/4”, widths, and wider beams can also be available upon request. With two high capacity RF production lines and a strong link to the required natural fiber resource, QB is one of the largest stock beam producers. Whether your project requires custom beams and fabrication, or truckloads of high quality stock material, QB is your one stop source. Our stock beams are supported in market by our network of quality distribution partners. These partners know the local market, they know the local builders and contractors, and they know our product line. Using their local knowledge matched with the quality QB product line you get the right product, at the right price to do the job right. Check out our distributors list to find one near you.